Embark on an experience 2,200 years in the making to discover the scientific story of the Terracotta warriors and the untouched tomb of the first Emperor. We were tasked with creating a projected experience that visualized the creation and deterioration of these statues. Video projected onto a life-sized, three-dimensional warrior replica shows viewers a time-lapse look at the entire 2,000+ year lifespan of these figures in just a few moments; beginning with their origins as fired clay and moving through layers of ornate paint being applied and then on to their slow, subterranean decay. Using high resolution photographs of the warriors, we recreated and animated these textures to show the passage of time from when they were fired to their unearthing. 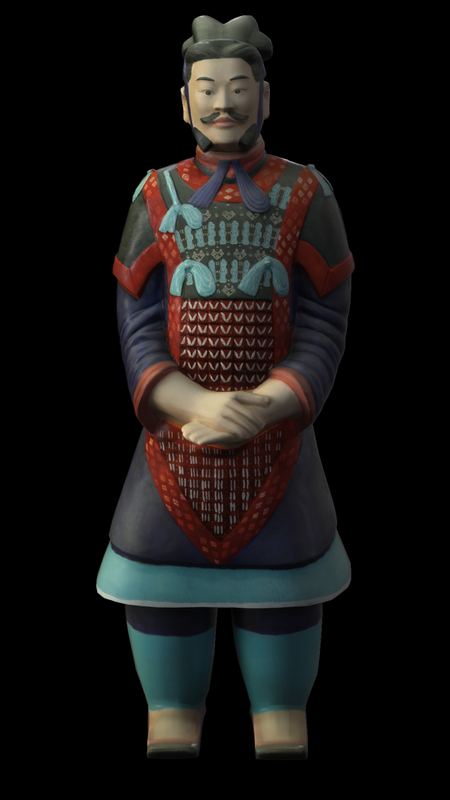 Since no 3D model existed, we photoscanned a life size replica and created a fully textured 3D model.